BOB And ZACK MOSLEY And "SMILIN' JACK"
Robert L. 'Bob' Mosley is a genuine American Hero who flew combat in the Air Force during three wars. Bob's Hero is and has always been his older brother, Zack Terrell Mosley who died December 21, 1993 at the age of 87. Zack had his eye on airplanes and flying when he was 7 years old. A pilot crashed near the farm where he lived in 1913. Then again in 1917 another pilot crashed near the same location. The Curtis Jenny fascinated Zack to the point that he sat in the damaged cockpit and played with the controls. While the Jenny was being repaired Zack drew pictures of the plane and dreamed of the excitement of flying such a plane. Zack kept sketching aircraft and pilots until he became quite good at drawing planes. His art teacher in high school was impressed by Zack's drawings and urged him to attend the Chicago Academy of Fine Arts. The rest is history. 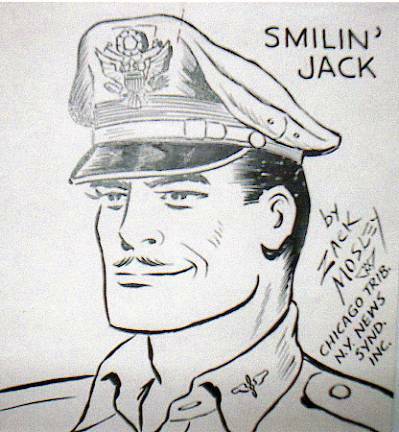 Because Zack was later given a position on the Tribune and his own strip which became "Smilin' Jack"-syndicated in over 300 newspaper from 1933 till 1973. Zack gave his brother Bob his first airplane ride and soon thereafter gave him flight lessons which started Bob on his lifelong love affair with flying airplanes. Zack flew with CAP on the east coast during WW-2 for hundreds of hours and carried a 325 pound depth charge to kill the German Submarines. 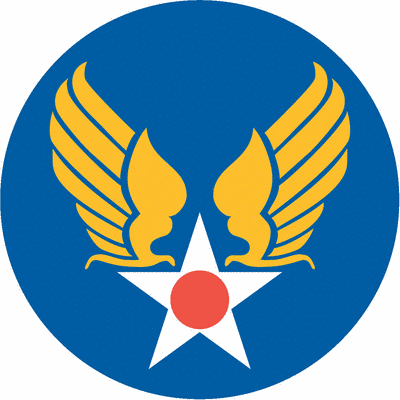 For his CAP work, Zack was awarded an Air Medal. Jack and Zack given to Bob at age 13. 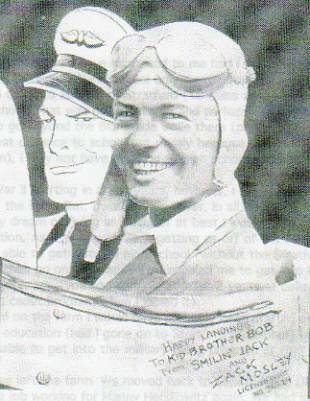 Bob spent five years working with Zack on "Smilin' Jack" and was flying all over the United States with Zack promoting the comic strip and spreading good will. Bob recalls that period in his life as priceless. Even though the broken service in the Air Force limited his upward mobility Bob would not trade the experience for the retired rank of General. Some of the good times Bob relates in the below story. In the 1946 era there was a sportsman flying club in Florida called the Florida Flying Alligators. To be eligible to become a member of this club you had to have flown over the Florida swamp for at least 100 miles. This was an easy achievement because in just flying to or from most any where in Florida you usually met those requirements. But, on top of that there was an initiation one had to go through to get the little pin and card that officially made you a Florida Flying Alligator. The party and initiation, this particular year, was to be held at the Melbourne, Fla airport. There was little activity at the Melbourne Airport at that time. The Navy operations had closed down after the war. There was a fixed base operation of some sort in business there but it was by no means a booming place; there were certainly no airline operations. I do not believe that there was even an active control tower but the field did have runway lights so you could legally operate at night. Zack and I were living in Stuart, Florida and were already Florida Flying Alligators. However, we planned to attend the huge party and Flying Alligators initiation that year at Melbourne. Zack had some friends he wanted to bring along also but it turned out that he had invited more friends than he had seats for in his 4 passenger (Stinson Station Wagon) airplane. Thus, it was going to mean two trips from Stuart to Melbourne to get everyone up there. Zack flew the first trip to Melbourne, with me as his co pilot, with two passengers in the back seats. I then flew the plane back to Stuart to pick up the other 3 visitors and got them back up to Melbourne just about sunset. Since I did not drink much alcohol in the first place, and never when flying was involved, it was understood that I would be the one to fly all of them back to Stuart that night (another 2 trips) when the initiation was over because Zack liked to party and the Flying Alligator affair was going to be a real party. The initiation party was held in an ex-Navy hangar just adjacent to where the air terminal is located today. In fact, if I am not mistaken, the floor of that hangar still remains there and a new metal hangar has been built over it, which is now used as the maintenance hangar for the Florida Institute of Technology Flight School. That night all of the airplanes were removed from the hangar and picnic tables were brought in and spread out over the hangar floor. I would estimate there were at least 250 people in attendance. A great meal was served and a lot of alcohol was consumed. This was followed by a few speeches and then it came time for the initiation. 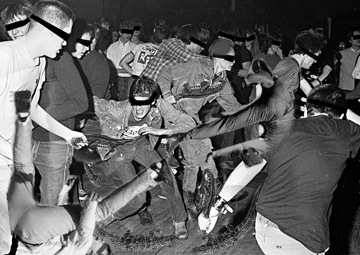 For the initiation, the hangar floor was cleared of the picnic tables and wet down thoroughly with a fire hose, thus creating “The Great Florida Swamp”. Again, to officially become a Florida Flying Alligator, you had to be initiated. To be initiated, you had to navigate the “Great Swamp” which meant getting from the north side of the hangar to the south side of the hangar, across the wet floor, barefoot and BLIND FOLDED. By this time of the evening, those to be initiated had well adjusted their attitudes and were fearless when told of their assigned task, of crossing the “Swamp”. However, prior to being blindfolded, when they were shown the 50 little 18 inch alligators, with real nasty dispositions, that would be out in the “Swamp” with them, their attitudes changed dramatically. Mercifully, after the blind folds were in place, the jaws of the angry little fellows were wired shut, but the initiates did not know it. I shall never forget that scene of those blind folded aviators slipping, sliding, falling, and screaming; mixing it up, with those little alligators. With each contact of an alligator there was a reaction like one might have had if they had shorted out an electrical circuit. Amazingly no one was injured. You would have to conclude that their attitude adjustment, from earlier in the evening, had something to do with it. But even so, from what I saw, there should have been someone hurt really bad; a truly unforgettable scene. With the party over it was time to go home, although going home from this party was a little different than the usual “going home from a party”. This meant two loads of very “Wild and Crazy Guys” had to be flown back to Stuart, which actually was a lot of fun even though the hour was late. To reflect a little on flying in those days, even as late as 1946, private flying was basically uncontrolled. It was indeed flying, much like the birds fly. You could jump in the plane and, like a bird that suddenly jumps off of a branch, just go flying off to where ever you wanted to go. The bird does not have to ask permission to go nor tell anyone where he is going; he just goes. So it was with me and flyers like me in those days. I never even considered filing a flight plan. I doubt I could have even if I had wanted to. Additionally Stuart did not have any runway lights (and certainly not a control tower) at that time, so my return trips necessitated landing in the dark. Not exactly legal, but Stuart was “my” airport so to speak (Zack actually had a hundred year lease on the north end of the airport) and knowing the airport so well and their being no other traffic involved, it really worked out quite well just using the landing lights. It was a memorable and fun evening and although my later years of flying were very much controlled I have never forgotten how much fun I had flying as free as the birds “back in the good old days”.